It was ‘Situation Saturday’ at the Superkarts! USA SuperNationals XVIII with the final round of heat races and the last chance qualifiers setting the final pieces of the grids for SuperSunday. Another picture perfect day outside the Rio All-Suite Hotel & Casino set the stage for the day’s action, which decided just who would race in the nine main events on Sunday, and who was going home. 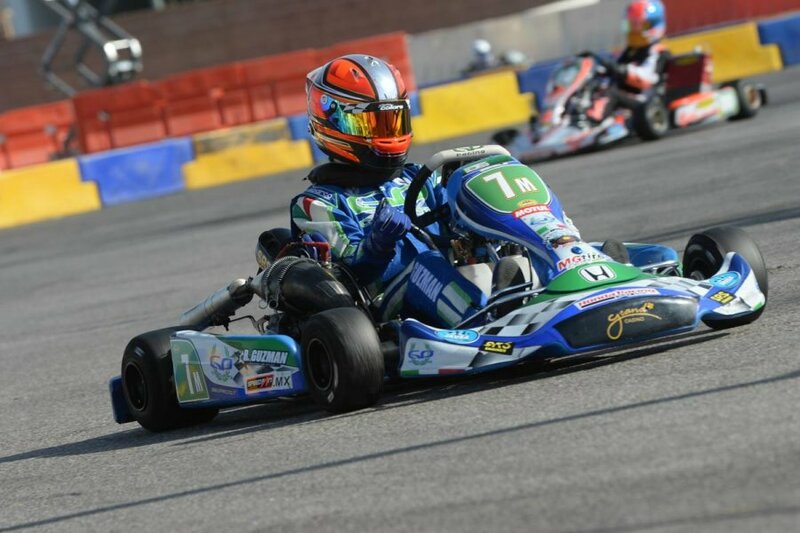 Logan Sargeant (Tony Kart) used the outside line to pull ahead of pole sitter Julien Andlauer (Praga) to assume the lead for the battle between the two fastest drivers in qualifying. Out to a big lead, Sargeant looked very comfortable out front during the first race of the third round of heat races. Andlauer was along in second with Zach Holden (Top Kart) running third until Luiz Branquinho (Italkart) moving to the spot on lap three. Sargeant pulled away to a big win, securing the pole position for SuperSunday, earning his third of the event. Andlauer finished second with Holden into third over Branquinho. Zane Morse (Top Kart) moved to fifth after contact involving Neil Verhagen (Arrow) and Gianluca Petecof (Tony Kart) dropped them down the order. The start was just what Brandon Lemke (Merlin) and Christian Brooks (Tony Kart) needed, as the two were able to get away and lead the field in the 12-lap race. 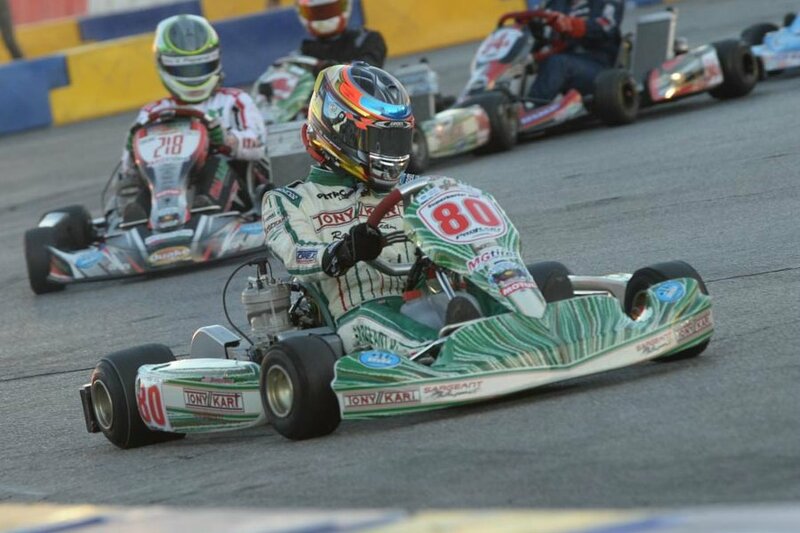 They were joined by former Pro Tour TaG Cadet champion Colton Herta (FA Kart). The top two shuffled the lead, allowing Herta and David Malukas (Top Kart) to close in, along with Anthony Gangi Jr. (Tony Kart) and Braden Eves (CompKart). The driver on the move was Gangi, driving his way forward and getting to the lead with just four laps remaining. He held on to score the win, keeping Malukas back from stealing the number one spot. Eves was able to complete his first heat race in the third position with Pro Tour title contender Brooks fourth, and Herta fifth. 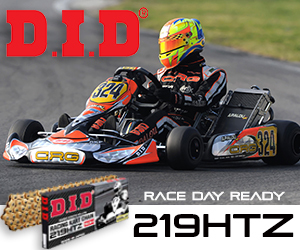 Braden Eves (CompKart) drove to the LCQ win from the pole position, securing his spot on SuperSunday. Brazilian Gianluca Petecof (Tony Kart) drove from fifth to second, with Canadian Roman DeAngelis (Tony Kart) up to third from ninth. Abby McLaughlin (Top Kart), Paulo Victor (Techspeed) and Michael Prinzo (Italcorse) also made it through with an uncontested 12-lap run. Top qualifier Kyle Kirkwood (Tony Kart) remained the driver to beat in the third heat, scoring his third win of the event to keep the pole position for SuperSunday. The Ocala Gran Prix driver pulled away with Miguel Lopez (GP) keeping him honest throughout the 12 laps. 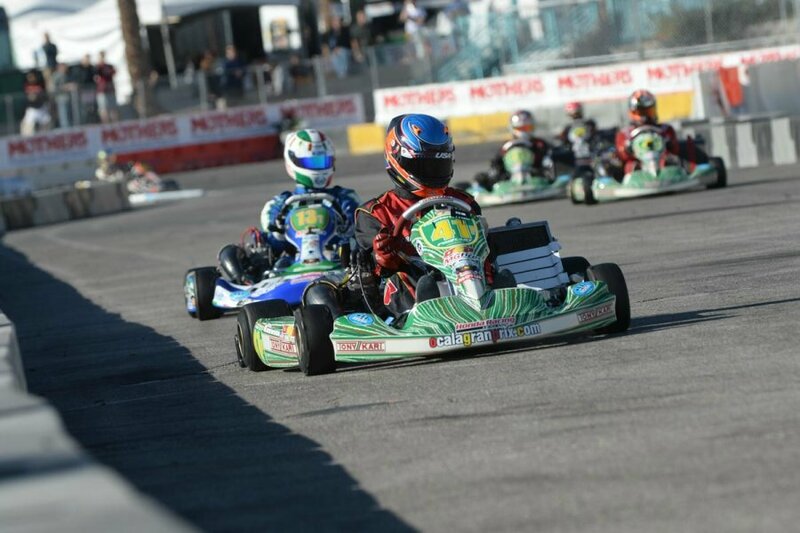 Texan Luke Shanahan (Tony Kart) recorded his best finish of the event, as did NorCal’s Hunter Pickett (Aluminos). Pro Tour championship contender Jonathan Kotyk (Tony Kart) ran to fifth. The final heat race for the S2 began with row two starter Sky Finley (DR Kart) unable to keep his engine running, and could not restart the engine, taking him out of the race before it began. Once green, Fernando Casillas Jr. (DR Kart) took the lead from the pole position with S2 rookie Jarred Campbell (Intrepid) giving chase. They were not alone with three others right there looking for their opportunity, including Austin Schimmel (CRG), Pro Tour point leader Austin Garrison (Tony Kart) and Aluminos’ Will Preston. Garrison was the one on the move, working into second and then with two laps remaining, stealing the lead from Casillas. 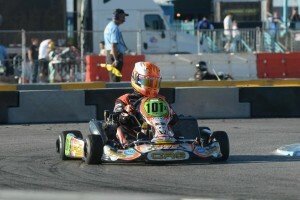 The Ocala Gran Prix driver scored his first heat race win of the event, beating Casillas and Campbell to the line. Schimmel drove to fourth with Preston a solid fifth over Aussie Jason Faint (Energy). All but nine drivers were involved in an opening lap pileup at turn two, ending a number of drivers’ chances at making it to SuperSunday. Out front, it was a clear drive for five drivers, with Jonathan Vitolo (Tony Kart) scoring the win over Curtis Paul Jr. (Tony Kart), Kory Estell (CRG), Myles Marolt (CRG) and Fabrizio Famularo (AM Kart). The race for the transfer spot included Famularo at one time, until Tyler Fling (Intrepid) came from 15th to seventh, and pressuring Billy Auffenberg (CRG). With three laps to go, Fling took over the position, ran a defensive line the remaining laps, and secured the final position to SuperSunday. Pro Tour point leader Trenton Estep (Sodi Kart) got his best start of the heat races, securing the holeshot to begin the final 12-lap moto. He lost the lead on lap two with Raul Guzman (GP) jumping up to the lead, and pulling away. Heat 1 winner Jacob Loomis (Intrepid) was third but fell back to fourth with Heat 2 winner Mathias Ramirez (Tony Kart) into the mix. 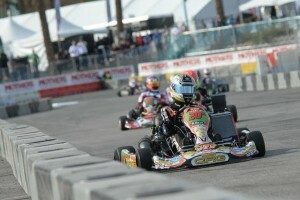 Pro Tour contender Christian Brooks (Tony Kart) was on the charge, coming from the 15th starting spot once again. Into the top-five, he worked past Loomis for fourth and began working on Ramirez for third. On the final lap, Ramirez was working to get past Estep and the two made contact heading toward turn two, Ramirez suffered the worse of it, going into the wall and ending his race early. Guzman drove away with the win as Estep crossed the line second, but was moved behind Ramirez in the results for the dangerous move he made that put the Tony Kart driver in the wall. That promoted Brooks to second, Loomis third, while Jason Pettit (Aluminos) was classified fourth with Callum Smith (Intrepid) fifth. Top qualifier Kip Foster (Arrow) was able to hold on to the lead after a hard fought opening lap with a challenge from three-time winner Leonardo Nienkotter (CompKart). Among the casulaties in the opening circuit included Pro Tour point leader Billy Cleavelin (CRG), unable to complete a lap. Both IndyCar driver Will Power (Arrow) and Richie Hearn (MMK) were with the top two drivers as the quartet pulled away from Ethan Wilson (FA Kart) up to fifth. Foster and Nienkotter showed they will be the ones to beat. That was until lap nine when Foster made contact with the barrier on the outside of turn one, damaging his machine to force him to pull off. Nienkotter went on to cross the line first, but was penalized two spot for a start lane infraction. That gave Power the win and moved Hearn to second. 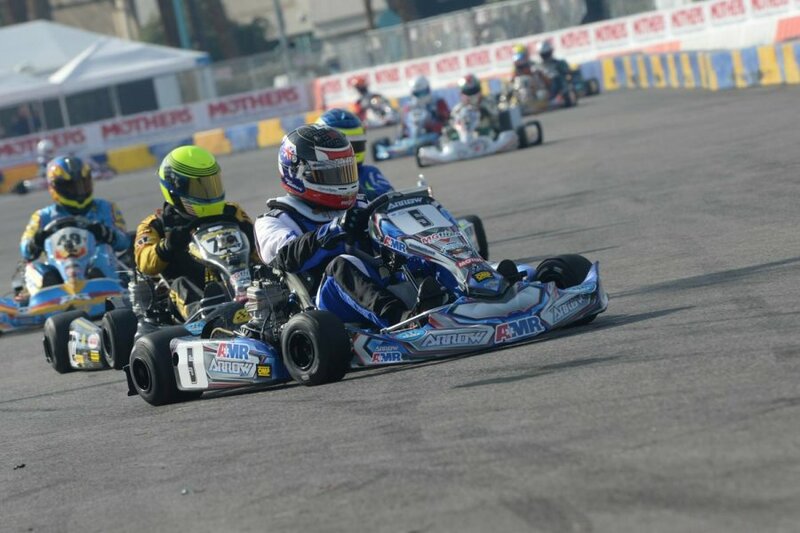 Christian Dischner (Top Kart) finished fourth with Diego Pelosi (Tony Kart) fifth, as Wilson dropped back to seventh with a broken water line. Davide Fore and Fritz Leesmann set their CRG karts on the grid for the final heat race to decide the SuperSunday lineup. Fore jumped off the line quicker than the two-time Pro Tour champion, pacing the field early. 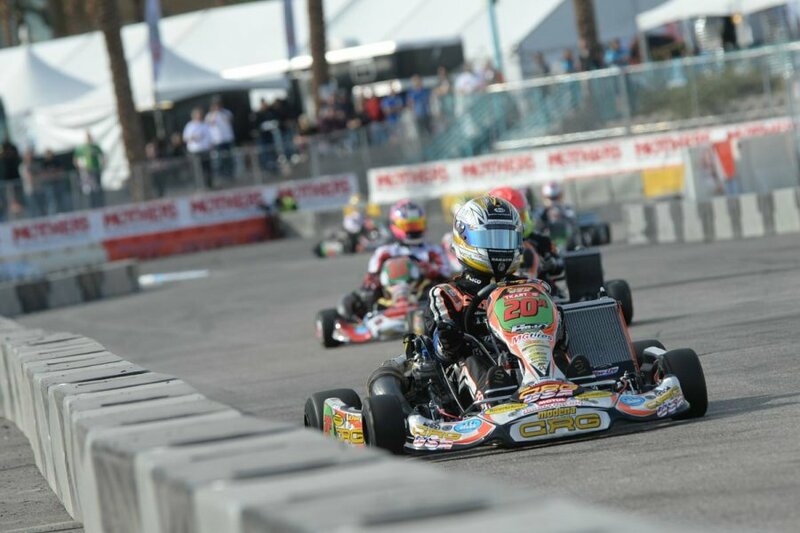 The driver on the move was Matt Jaskol (CRG) as the Las Vegas driver was into the third position after two laps, pushing Danny Formal (DR Kart) to fourth. Lap four, Formal was able to work back around Jaskol, bringing Pro Tour point leader Jordon Lennox with him. Jaskol’s trouble continued with a bent axle on lap six, taking him out of the race. That move Gary Carlton (TB Kart) into the top-five, with the front four well ahead. As the race progressed, Lennox appeared to be the quick driver, working by Formal and then laying down fast laps of the race to catch and pass Leesmann for second. Posting even quicker lap times, Lennox closed up on his fellow CRG factory driver, but Fore scored the victory. Formal worked by Leesmann for third with Carlton holding off Jordan Ford (Vemme) in fifth. The first attempt at a start was waved off as the lights went off before the track was clear and ready, so the field returned to the grid for another attempt. Outside polesitter Jimmy McNeil was moved back 10 positions for a engine change, placing Mike Mantel (Tony Kart) lining up outside defending race winner Matt Hamilton (Aluminos). Mantel grabbed the holeshot, with Hamilton and Darren Elliott (CRG) right there. Turn four, the Kiwi was back at the point, leading the way as they reached the stripe for the first time. The chance at a third heat race win went away as his rear bumper began dragging and was forced to come in. That advanced Mantel to the lead with Chris Jennings (DR Kart) powering through in the first few laps to close up on the leader. Lap six, Jennings took the lead and began to stretch out a lead. The fastest driver late in the race however was Ryan Pool (Tony Kart), up to fourth and stalking 2012 Pro Tour champion Eddie Olpin (Kosmic). That was until the 11th lap when he made contact with the barriers and bent his axle, ending his race. At the checkered, Jennings scored the win with Olpin around Mantel for second. McNeil fought back to fourth with Vivek Tandon (CRG) in fifth as Elliott finished ninth with a shifter issue. From the pole position, Gian Cavaciuti (GP) set the pace, clean off the line as Trevor McAlister held from the outside of row one. They pulled out to a lead with Aussie Jason Faint (Energy) leading a long line for third. Faint got away and had the two leaders right in front of him by lap four, as Rob Logan (CRG) fell under pressure from Pro Tour champion Jordon Musser (Birel) and Mike Beeny (Tony Kart). By the halfway point, it was the top five all together and now ‘T-Mac’ at the point for the first time. Lap eight, Beeny moved up to third, pushing Faint to fourth. Cavaciuti retook the lead with three laps remaining, and held on for the win over McAlister. Faint won third back from Beeny as Musser finished fifth. The S4 LCQ witnessed a number of drivers in the top six, and then lose their chance at SuperSunday. Early on, Elvis Stojko (Maranello) was comfortably in the top-six, then suffered a spin on lap four. Ryan Pool (Tony Kart) was in the hunt, but then was knocked down the order. Bermuda’s Scott Barnes (Intrepid) fought his way forward from 19th to finish fourth, earning a spot on the SuperSunday grid. Nick Firestone (DR Kart) won the race ahead of Jim Kidd (CRG) and Terry Lawrence. The fight was for the final two spots in the end with Christian Bouhuys (DR Kart) and Pool fighting forward to pusth Coy Dayton (Intrepid) out. From the outside of row one, Jack Doohan (Tony Kart) paced the field for the opening TaG Cadet heat race of the day. Top qualifier Trey Brown (Tony Kart) found himself falling back to fourth as the two d’Orlando brothers of Nicholas and Michael pushed their Tony Karts to second and third. The top four established a solid advantage over the rest of the field, with Sam Mayer (Merlin) leading that train. Lap six, Nicholas drafted by for the lead, with Michael sneaking by in turn six and Brown coming through a couple corners later. Doohan fought back, getting past Brown for third and then into second on lap eight. Michael fought back to reclaim the spot and then began pushing his brother to try and establish a larger lead. Doohan and Brown stuck right with them, and drove past Michael for second, bringing Brown with him. It was a wild final lap with Michael d’Orlando escaping with the win. Brown followed in second with Doohan holding on to third. Jak Crawford (Benik) was able to sneak his way into fourth, pushing Nicholas d’Orlando to fifth with Dylan Tavella (Tony Kart) right there in sixth. Italian Guiseppe Fusco (Lenzo) paced the field, taking advantage of the pole position starting spot. Derek Carmenate (Benik) slotting into second but Alex Verhagen (FA Kart) was on a charge, into the spot by the end of lap two after starting sixth. Fusco however established a near two-second advantage on the opening laps however, and it continued to grow with the race for second stepping up. Sebastian Alvarez (CRG) took a turn at second, with Broc Feeney (Tony Kart) pushing Verhagen back to fourth. Lap six the fight for second ended with contact including all three drivers. 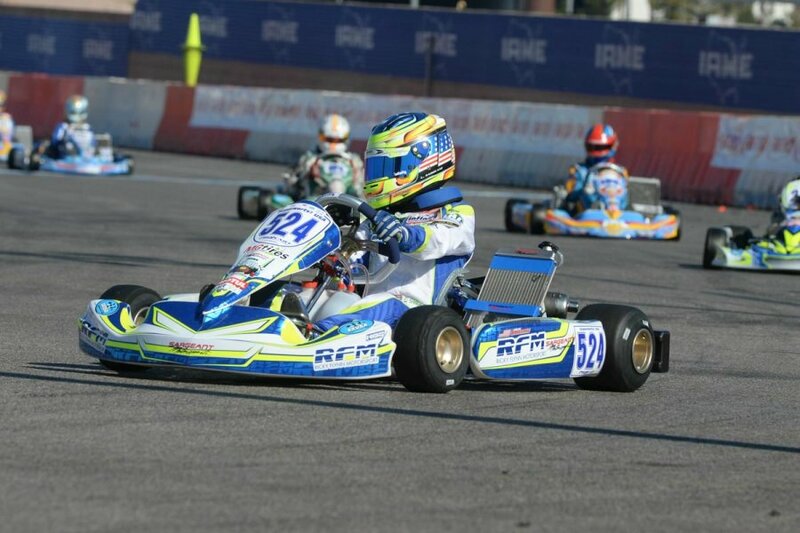 That promoted Leonardo Marseglia (CRG) to second, Lochie Hughes (Praga) to third and Carmenate fourth. Hughes was able to secure the second spot and drive away, but could not close up on Fusco as he took the checkered by more then five seconds out front. Carmenate won the fight for third over Marseglia with Sam Paley (Techo) into fifth. Three drivers established themselves early as top drivers in the LCQ. Reece Gold scored the race win, ahead of Sebastian Rodriguez. Payton Durrant (Tony Kart) led the field to the green flag, and fell back during the race, but managed to finish fourth behind Jeremy Fairbairn. Juan Diaz and Stephen Brucker fought their way into the top-six, and into the SuperSunday main event. It was much of the same in the KZ2 final heat race, as top qualifier Paolo de Conto (Birel) led the 12-lap event, keeping his perfect score in tack. Out to a one-second advantage after just one circuit, he drove to a 1.3-second win and retaining the pole position. Jonathan Thonon (Praga) fought off Bas Lammers (Formula K) early, as the 2009 winner fell down the order after lap six. This moved David Fore (CRG) up to third, until he was shuffled back by American Gary Carlton (TB Kart) along with Hajek, Lammers and Lorenzo Camplese (Maranello). Hajek ended up taking the third spot with Carlton fourth and Camplese fifth. A large group of drivers piled up in turn two once again, including a number of the mid-pack drivers, from about row five on back. Top qualifier Jake Craig (Tony Kart) retained the lead with Mark Boos (Tony Kart) up to second as David Sera (Deadly) fell back to fourth behind Santiago Porteiro (Kosmic). Craig held a half-second lead after three circuits, with Sera moving up to the second spot and clean track in front of him to reel in Craig. It took just a few laps before the multi-time Australian champion was on the bumper of the Pro Tour point leader. It took him until lap 10 to get a good run down the front straight and take over the lead from Craig. On the final lap, Craig tried for a move around Sera, holding the spot for just two corners before Sera returned. That allowed McCusker to sneak in and challenge for second. Down the line, Sera held off Craig with McCusker right there. Porteiro finished fourth with Boos a solid fifth. A much better start for the final grouping with only a few bad moves that cost just positions, and not the entire race. Kris Walton (Arrow) took the lead from polesitter Ben Stewart (Arrow) on the opening lap. Stewart, with the help of Danny Formal (DR Kart), pushed Walton back to fourth on lap two, with Dalton Sargeant (Tony Kart) into third. The top two pulled away by a half second, but it was closed up lap by lap with Sargeant and Vinicius Papareli (Italkart) inching forward. Formal seemed to lose pace compared to the other three, with Sargeant now looking for a way past for second. Lap nine, Sargeant completed a pass into turn one, with Papareli through at turn five. 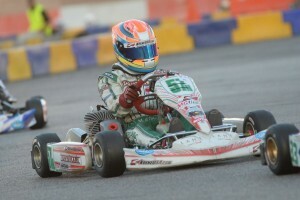 The quickest driver of the race was Top Kart driver Marco Maestranzi. Starting seventh, he moved into fifth and ran down the leaders with fast lap after fast lap. As they took the white flag, he drafted past Formal for fourth, but ran out of time to catch Papareli. Stewart went on to take the win, with Sargeant second. The final Last Chance Qualifier held outside the Rio with the Stripe as the backdrop, and the lights of Vegas shining, wrapped up Saturday. It was an amazing 12 lap event, with the final transfer spots going down to the wire. Out front, Kevin Monteith (Praga) scored the win over Christian Munoz (Tony Kart) and Chris Cricca (ART GP). California ProKart Challenge champion Austin Elliott (Kosmic) was fourth with Travis Lowe (Praga) ending up fifth. He was challenge throughout much of the race, until the end. Nick Martin (Parolin) was within the top-six, but was pushed back by Mike Bartels (Tony Kart). Bartels was challenged toward the end with Niklas Kry (Top Kart) going side by side for nearly an entire lap. Their fight brought in more players, including Nick Ramirez (Top Kart). On the final lap, Ramirez held the sixth spot briefly, before Bartels retook the position with a hard deep braking maneuver into turn three. That secured the position and the final spot on the SuperSunday grid.